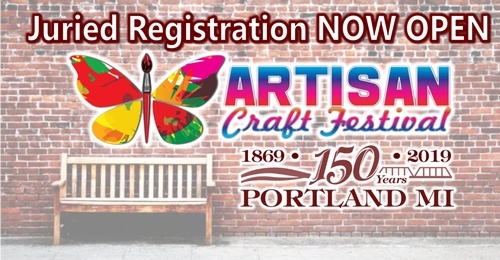 Now accepting registrations for an Artisan Craft Festival held during Portland's 150 Year Celebration Weekend, Saturday Sept. 21 from 10a-6p. 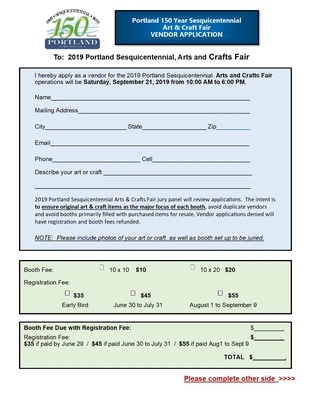 All artists and crafters are welcome to register for this part of our Sesquicentennial Celebration to display and sell their arts, crafts, and re-purposed items. All registrations will be reviewed by a jury panel to ensure original art & craft items as the major focus of each booth. Photo's to be submitted with registration. This will also allow us to avoid too much duplication of product. 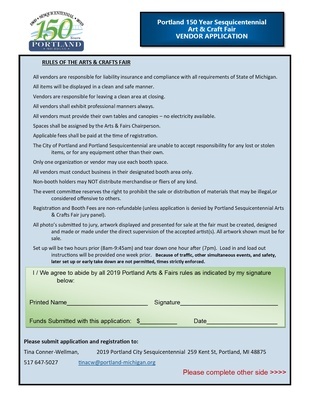 Please visit www.portland150.org for registration form which includes complete details. Please share with artists and crafters you know! This is expected to fill early, register soon - discounts also apply for earliest registrations. Saturday Sept. 21 from 10a-6p. Please see registration form. Fees based on selected booth size, discounts given for earlier registration.